I’m not normally a fan of mock off-road cars. Imagine how embarrassing it might be to find yourself stranded by a gentle dusting of snow, in a car made to look as if it could cross Siberia. Honesty seems a better policy. 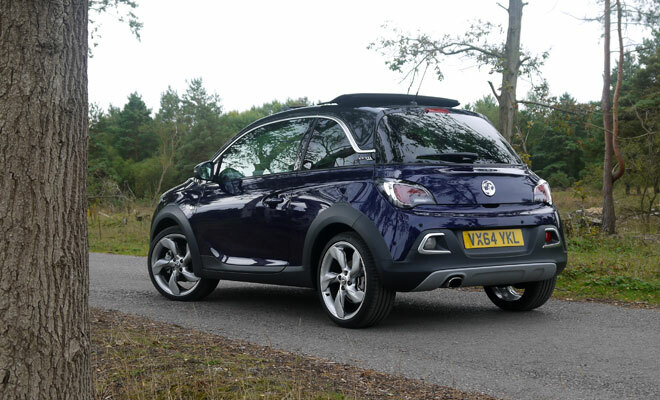 The Vauxhall Adam Rocks gets off with a warning, however, as it looks so much better than the standard car. The taller stance and chunky cladding contrast with the compact, egg-shaped bodywork to create a surprisingly appealing mix. Just don’t try crawling over any actual rocks. 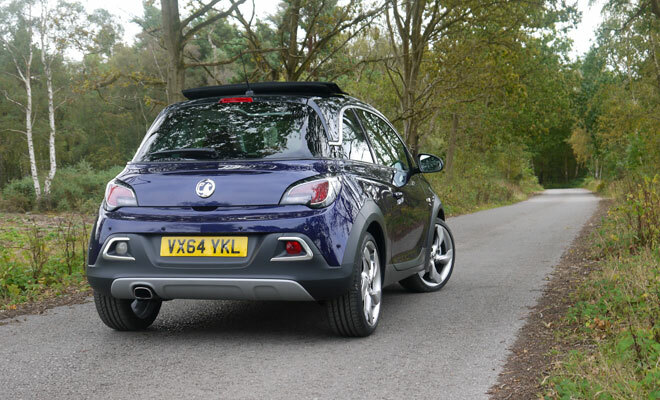 Raising the ride height by 15mm has certainly altered the facet I most disliked about the ordinary, non-Rocks Vauxhall Adam I tested last year. That particular car felt as if its wheels, tyres and suspension had been laboriously chipped out of granite by some insane automotive sculptor. In the Rocks version, by contrast, you can hold an actual conversation without sounding as if you’re gargling. You do pay a price for the Adam’s newfound softness and comfort, however. More pronounced body roll is to be expected, but I was surprised by how squirmy the Adam Rocks feels in corners. You turn the wheel, the big grippy tyres follow suit, and then the body lollops into the corner half a second later, as if hauled in by bungee cord. This isn’t an entirely pleasant sensation, but I prefer it to being rattled to death. A more dramatic improvement sits under the bonnet. 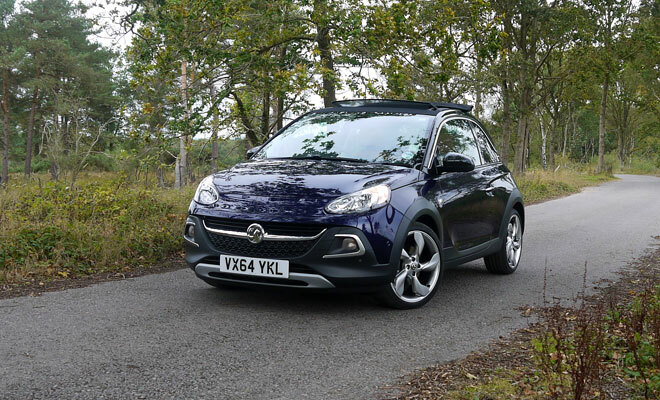 Vauxhall’s new 1.0-litre, turbocharged petrol engine feels like an enormous leap forward from the breathless old 1.2-litre lump I tried in last year’s Adam. The new engine provides plenty of poke – up to 115 horsepower and 170Nm of torque – without excessive thirst. Light aluminium construction, a part-time water pump, a stop-start facility and only three rather than four cylinders help to achieve an official combined cycle result of 55.4mpg, plus a 119g/km CO2 rating. An ordinary Adam with the same engine, by the way, is rated at 57.6mpg and 114g/km, so the penalty for the Rocks styling works out at about four percent. The engine feels extremely strong and flexible, and the cabin remains surprisingly quiet and free of annoying vibrations. Drive sympathetically and you might even get a result within striking distance of the official figures too, if the dashboard indicator can be trusted. And when you’re not so worried about guzzling fuel, you can floor the throttle and reach 62mph in 9.9 seconds, apparently. 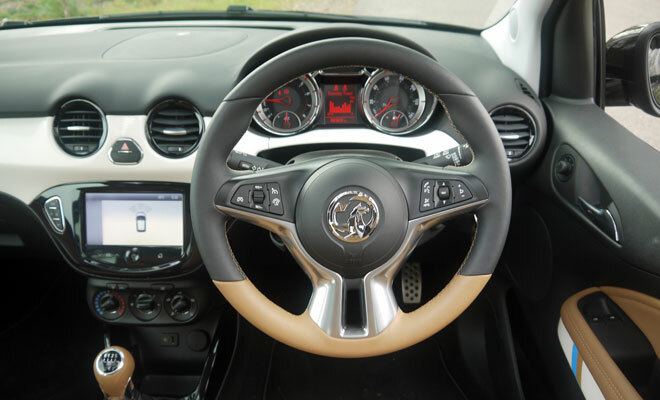 The chunky, leather-rimmed steering wheel feels good to hold, even if the connection to the road does feel as if it might be operated by a system of flags rather than anything mechanical. 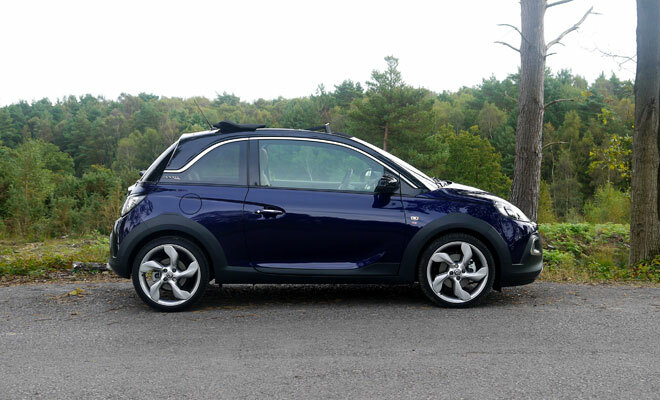 A six-speed gearbox is welcome – the Adam I drove last year had only five speeds and really needed another cog. 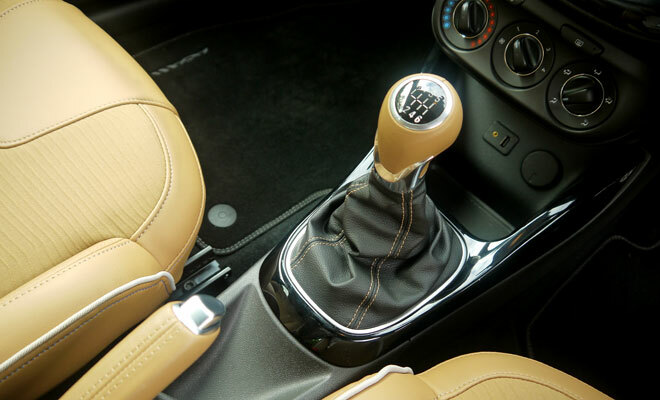 The long sixth gear keeps noise down and economy up when cruising on faster roads, while the engine’s torque serves up plenty of flexibility in the middle gears. The instrument panel provides both up and down shift hints in eye-catching orange, and seemed reasonably aware of when I might be accelerating, climbing a hill or simply bumbling along in the wrong gear. The gearbox would be even more welcome if it weren’t quite such a ball of rubber bands. I felt a surprising amount of wiggle to the stick when in gear, making the move from slot to slot a lot less precise than I’d like. A big fabric sunroof comes as standard, finished in either black or brown – indeed the proper name of the car is Adam Rocks Air, to signify its open-air top. Presumably a tin-top edition, Rocks minus Air, will arrive in due course. The roof will zip back level with the door pillars in seven seconds, requiring just a quick prod of the overhead button. Fully closing it again requires a sustained push, or you can let go and leave the roof only partly open. There’s never any need to get soaked by a passing shower or miss a fleeting glimpse of blue sky, as the roof works even on the motorway, at speeds up to 85mph. A small spoiler flips up at the front of the open roof’s aperture, to try to keep noise and buffeting at bay. It is reasonably successful at this job. In the car I tested, some speeds were more restful than others with the roof open wide. When shut, the interior is commendably snug and peaceful. 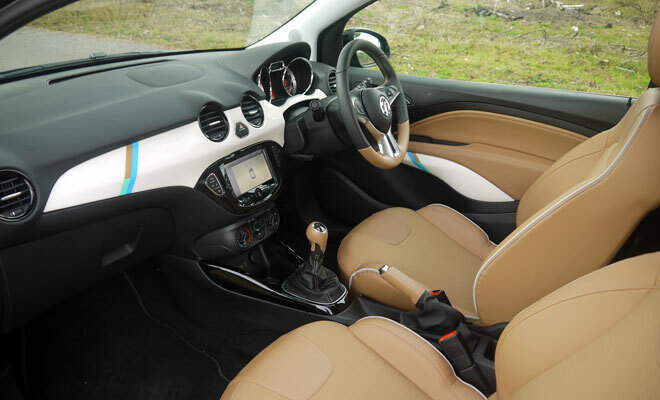 Front seat accommodation is extremely comfortable, with well bolstered seats trimmed as standard in a mix of cloth and a quite convincing artificial leather. Real cow costs an extra £700. The warm, toffee-coloured faux finish in my test car looked particularly inviting. The rear seats, by contrast, are about as welcoming as a mortuary drawer. If you want room for heads, legs and elbows, or easy access to the back bench, best go looking in a different car. The best thing you can do with the rear chairs is probably to flop them forward, which increases the boot from a 170-litre slot, barely big enough for a carry-on case, to a more useful 663 litres. 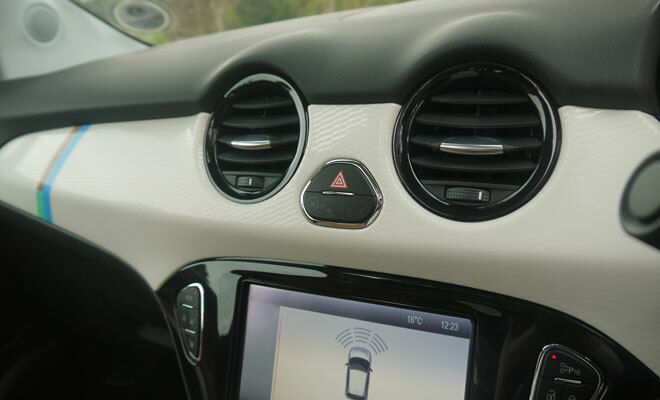 There are oodles of options to choose from including heating for the seats and steering wheel for £215, a seven-inch touchscreen with USB and Bluetooth hook-up to your phone for £275, a climate control upgrade from the standard aircon for £300, auto lights and wipers for £200, rear parking sensors for £275 or full park assistance for £450. The standard alloys are 17 inches across, while an upgrade to 18-inch diameter costs £800. LED running lights and tail lamps come as standard, as does DAB reception for the stereo. Prices for the car itself start at £14,695, although that’s with a weedy and not very efficient 1.2-litre engine that’s probably best avoided. The 1.0-litre turbo I tested starts at £16,695. Throw in a few options and your Adam Rocks Air might easily end up the wrong side of £20,000. And that’s a lot of money for a small car, even one with such big ideas.